I have recently re-discovered hula-hooping. When I was a little girl, that bright orange and white striped circle was both entrancing and maddeningly frustrating. It always seemed to land on the ground just when I thought I had the hang of it. Yet, I could never get enough. I spent many, many hours in my front yard mastering the art of hula-hooping. Now, years later, I happened upon a couple of hoops at a neighborhood garage sale. Thinking they’d be great for my daughter, I snagged them for a quarter apiece. Of course, ‘for my daughter’ ended up looking more like a squealing preschooler hollering ‘Again, Mommy! 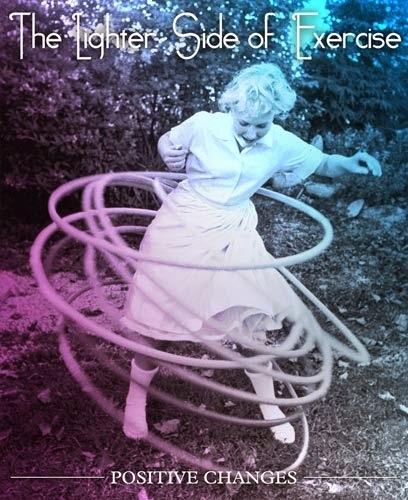 Again!’ as she ran circles around me and that maddening, oh-so-entrancing plastic hoop. After 30 minutes or so, I threw in the towel and grabbed a glass of cold water, realizing I had worked up quite a sweat. And that’s when the light bulb lit up over my head. I realized that I didn’t need a fancy gym membership, or stringent workout routine to work up a sweat. I just needed to be a little, well… creative. It was like the floodgates opened as I imagined the possibilities of what I’ve come to call the ‘Lighter Side’ of exercise. Hula-hooping, jumping on a trampoline, swimming, playing dodge ball or kick ball, splashing at a water park, strolling through the zoo or art gallery, jump-roping… the list goes on and on. Now, I’m not saying there’s anything wrong with traditional methods of exercise. They’re certainly proven, and many people swear by them. But the realization I had that afternoon in my front yard with my daughter was that exercise didn’t have to end once I got off the treadmill. I can incorporate being active into just about everything I do. Even chores like sweeping the floor, I do with gusto now – singing and dancing with my daughter to her favorite silly songs. I guess the moral of this story is to discover the ‘Lighter Side’ of exercise in your everyday life. Find out what makes you laugh, what makes you sing, and what makes you feel alive. Find those moments and fill them with as much energy and activity as possible. You’ll work up a sweat, burn off an extra pound or two, and maybe even fulfill that ‘live life to the fullest’ mantra that we’re always striving for.